A note about duration. Click here to learn more about why workshops are 2-3 weeks in length. Free 1-year trial membership in AMTA! Participants in full workshops this summer are eligible for a free 1-year trial membership in AMTA. Your workshop leader will provide you details on how to enroll. At the end of the year you will have the option of renewing your membership. Follow this link for some details. Ask your school district to pay for your Modeling Workshop. The document HowGetFinancialHelp from Jane Jackson offers advice on getting financial help from your district or other sources. Below is a current list of workshops. Some workshops are contingent on funding and sufficient enrollment to make them cost-effective. Unless otherwise noted, workshops are open to high school and post-secondary science teachers worldwide. Note: Middle School Science (July 11-29), Mechanics (July 18-Aug 5), and Chemistry I (July 18-Aug 5) all run for 3 full weeks and cost $999. Chemistry II (July 5 -15, led by Larry Dukerich) is a 9-day workshop and costs $899. $400 scholarships are available for participants who are paying the fee themselves with no reimbursement. All workshops will be held at Columbia Teachers College, 525 West 120th St., NY, NY, except High School Chemistry II, which will be held at a public high school 3 blocks from Teachers College. There will be ample opportunities for interaction among teachers in these workshops. These 1-week professional development experiences afford participants the chance to explore aspects of modeling instruction. 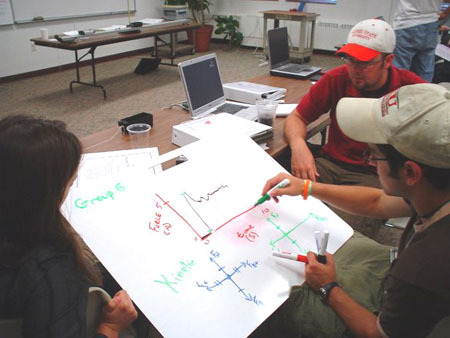 The Department of Physics and Astronomy at Siena College is offering a four-day introductory workshop on the Modeling approach to teaching high school physics. The workshop will focus on utilizing whiteboards to facilitate student-to-student discourse in the physics classroom. Teachers will work in “student mode”, as they attempt to piece together the salient features of the models presented. This summer, we will once again focus on the 9 Mechanics models. Registration is limited to 24 people, and participants will receive 24 hours of professional development that may be applied toward re-certification Please feel free to invite any other individuals who might also benefit from this workshop. The workshop will take place on Tuesday July 5 – Friday July 8 2016 in Roger Bacon Hall, Room 250 from 8 – 3. The workshop, including lunch on the first day will be provided at no cost to the participants. $30.00 from each participant will cover lunch for the remaining 3 days of the workshop. Breakfast items will also be provided each day.